Love this mattress! I was not to sure to order on line, but this was worth the money! Sleep in total comfort on this Christopher Knight Home gel memory foam mattress. 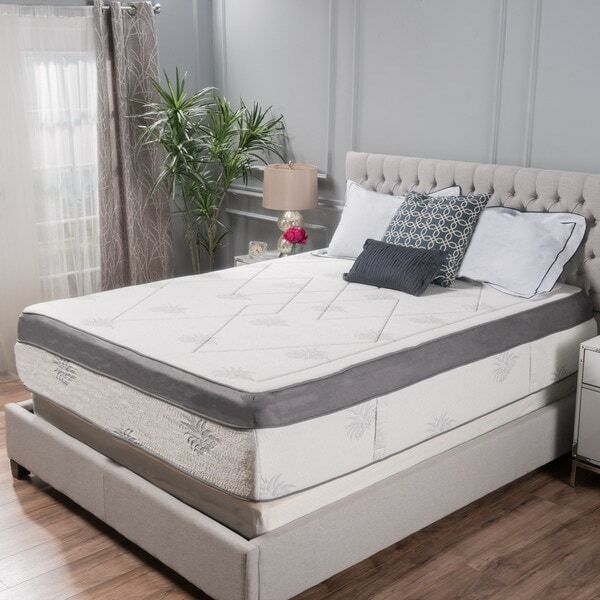 This memory foam mattress is temperature sensitive to adjust to your body while helping to improve circulation and reducing painful pressure points. Resistant to dust mites, this mattress never needs to be turned, ensuring many nights of restful sleep. Overall, this is a great memory foam mattress for the money: Pros - High quality, resilient memory foam - Cool top layer really does help it from overheating like traditional memory foam - Great price on Overstock, at least half off retail prices for similar quality - Shipping was fast and easy Cons - Not actually 15 inches thick after shipping. Even after unpackaging the mattress and leaving it out for 48 hours before using it (as many memory foam products recommend), the mattress only expanded to just under 14 inches thick. I even waited an extra day (72 hours total) before using to see if that would make a difference. It didn't. However, only about 1 inch of difference in thickness isn't a big deal to me, so I decided to keep it. The other dimensions were accurate. - Slightly less firm than I expected. Admittedly, it's hard to gauge firmness without trying firsthand because the scale isn't standardized across manufacturers. However, the description noted that the mattress is made of layers of both 5lbs/cubic ft and 4lbs/cubic ft foam. This is considered very high density by most. I expected this would also give an extra firm feel. Instead, I would say the mattress is firm to medium-firm. Nonetheless, the memory foam seems of high quality and is very resilient. Overall, I am happy with the purchase and think it was good deal. The mattress is much better than most "bargain" memory foams I've tried out in person and nearly as good as the top of the line brands. Definitely worth the money, but note the thickness when buying sheets and keep in mind it may feel softer than a traditional mattress. let me start by saying that I am by no means a memory foam aficionado. Prior to owning this mattress I had slept on one other memory foam mattress a handful of times - I loved it (hence my purchase) but found it to be very hot once I woke up. With this mattress I don't have that problem! I'm enjoying the best sleep I've had in years and waking up totally refreshed ( and not sweaty!) I've had this mattress over a month, and haven't noticed it losing elasticity yet. Being a large girl too, I've found it's incredibly supportive. All in all, I'm sure better products exist - but this is a great buy! I've been sleeping on this bed for a month now and I love it! I was very nervous about switching from a traditional mattress and box springs to a memory foam mattress but have been very happy with the change. It does take a couple of nights to get used to the difference. Very glad that I opted for a mattress with gel/cooling agent as I've heard complaints from several others regarding sleeping hot when switching to memory foam. I would describe this mattress as luxurious. Not too firm, not too soft. I feel that my lower back pain has definitely been reduced. Before, I would wake every time my husband got into bed or turned over. Now I don't even stir when he gets in bed. I also find myself tossing and turning less at night. The only problem now is that I don't want to get out of bed! I did a lot of research on memory foam before this purchase. Tempurpedic was out of my price range but when you compare foam weights (the lbs listed) this mattress is the next best thing. The higher the lb of the foam the better quality and supportive memory foam properties most are looking for. A lot of the really inexpensive beds are made from 2lb maybe 3lb and will lose their rebound factor sooner and just be less supportive in general. I just spent my first full night on it and it was wonderful. It is not too hard and not too soft. I am 5'3" and 120lbs but my boyfriend is 5'10" and 200lbs and he is comfortable on it as well. I have a $$$ *********** pillow directly from the company and they are very similar. This bed does weigh a ton and moving it around to open it was not easy but again I am a petite person. I'd hate for anyone to purchase this and be terribly unhappy because of my review but if you are a reasonable person and want a reasonably prices memory foam mattress that is supportive, medium firmness and not horribly hot this is a good bet. I have bamboo rayon sheets I got from ********* that make it extra incredible and they stay cool too. Oh ya I live in central FL and have window unit a/c in my 2nd story apartment so I know what hot is. Hope this helped and sweet dreams! Purchased the bed about 4 months ago, my wife and I are very happy with the decision. We both have back problems and the firmness and support on this bed are amazing, we both get a much better nights sleep now, and not sore or cramped in the morning, However if you have never owned or slept on a memory foam mattress it does take about a week to get used to the feeling/firmness... this is not equivalent to a memory foam topper on a box spring. I have not noticed any sagging in the mattress as of yet. The smell of the mattress when taken out of packaging is not bad, air the thing out for a couple of days and stop complaining. This bed is like sleeping on a cloud. I needed a bed that did not compress nerves or other pressure points and provided great support. I'm both a back and a side sleeper. This bed is the most amazing thing...it's like being cushioned in a cloud. It keeps me from sweating at night. It is wonderful. I bought a 3" gel foam topper for it, as well, as I wasn't certain how firm it might be. It is truly med/firm. The 3" topper was a great addition (i was worried my sheets wouldn't fit over both, but they better than ever)...it took the bed from awesome to REALLY AWESOME. Also, for anyone concerned their bed will smell funny when first unwrapped...it doesn't I let it breath for one day and by nightfall she was ready to go. No strange smells, super comfy. LOVE IT. I was extremely excited and anxious about ordering this product. I've developed severe lower back pain due to an old, non supportive mattress and felt this purchase would be a cure all. However, was very disappointed especially because of the no return policy. I do not like mattresses that sink, and although the description described memory foam as conforming to one's body, I felt like falling into a sink hole was a better description. It's especially uncomfortable if sharing the bed with someone. If your looking for all over support I would highly recommend something other than memory foam. I once had a 15 inch custom made futon that way surpassed the comfort level of this mattress. Wish I could return and go custom made. I love gel foam mattresses but not too soft. This mattress is very firm with all the advantages of gel foam. Had 4 inch memory foam topper on our old mattress. Very nice. Bought this mattress because of the age of our other mattress. A lot firmer than the old 4 inch , 4 lb. topper. Lot more support, also. Glad we purchased this mattress.. Would buy again and would recommend to family and friends. I have been wanting a new mattress for a long time and did quite a bit of research. My previous mattress was a pillow top and did not hold up well. This mattress has exceeded all of my expectations. Soft but supportive and comfortable. I actually enjoy going to bed now and wake up without the back aches and head aches that i had with my old mattress. I just love it! Best purchase I have ever made online!!! I have never made a purchase from overstock before let alone such a large one online. Buying a mattress from overstock was easy, fast, and reliable. This mattress has almost reduced my morning back pain by 100%. there was no weird smell when I opened it. the matress stays cool at night and is soft but has the perfect amount of support. I was also able to purchase ans extended warnty through overstock. the papers were sent a week after I recieved my mattress. friends have told me it feels like a 1400 dollar mattress ( but i didnt even pay half that!!!) WORTH EVERY PENNY!!! This is not the first mattress we have purchased fro overstock but it maybe the last..The mattress was supposed to be firm but it has been anything but. My wife and I thought it would adjust and get firm. It never happened . We struggled to get out of bed and one side got even softer. It was as the mattress swallowed you up. The firmness never evolved. Started having back pain and other problems. I don't know if overstock will contact us or if we just have to swallow or loss. I'm hoping overstock will do something with the mattress warranty. We enjoy shopping at overstock but will wait to see what develops. Buying mattresses is turning into an expensive thing for my wife and I...We are both retired etc. etc.etc.. This is a firm mattress, yet soft enough that it cradles your body's curves. The lady at my local furniture store was trying to sell me a gel memory foam mattress that was more than double the price of this one and this one is thicker and just as comfortable! I'm glad I did some more research online because I was very close to dropping all that extra money for something equivalent to this. This mattress is a great investment. I have been sleeping on this mattress for about 2 weeks now and am very happy with it. I am not used to memory foam mattresses and I do notice that the mattress gets slightly warm after laying on it for a few minutes. I would consider this medium/firm rather than firm, but I 100% am happy with the purchase. I will try to update my review after 6months of sleeping on the mattress. Yes very nice. The mattress sleeps very good. Like that you never have to flip the mattress. Came in the mail as scheduled. I was expecting the mattress to be firmer. Too soft. This is an excellent mattress. It came very compacted in a box, but after two days, it was perfect. The memory foam mattress is great. The way it hugs your body and keep you cool is amazing. I would recommend this mattress to anyone who is looking for a good night sleep. I love my new bed. This is my second memory foam bed and I love this one. The gel infusion makes it so nice and cool, but not cold. A great buy for the price. I ordered this bed for my son a year ago; he's a college athlete, and swears it is the best mattress he has ever had! A few weeks ago, I took a nap on the bed (he's away at school), and I must say it felt amazing! I loved it so much that I ordered another for my daughter and son-in law for Christmas...and it's unanimous...EVERYBODY LOVES THIS MATTRESS!! I have had this bed for over 3 years and it is so comfortable. IT is actually cool to sleep on. I bought a mattress cover to go over it because the zipper in it broke but other than that it has been a great mattress. Best mattress for the money! I bought this mattress about 3.5 years ago because it was the firmest I could find. It was perfect and gives good support even after all these years. I have a tempurpedic bed and this is as close as you can get without breaking the bank. Highly recommend and would buy it again without hesitation again. This by far is the best mattress I have ever purchased. It very comfortable and has great support. I use to wake up with back ach every day. Wit this mattress my back ach is nonexistent. Great price, great product. I love this mattress. It fit right on top of my box springs. It is super thick and is beautiful. However I sleep right in the middle of the bed and I"m noticing that it is starting to sag. I've had it for about 6 years. "How heavy is the mattress?" This mattress weighs approximately 114 lbs. "can this mattress be used on an adjustable bed"
As long as the bed is a queen size, maybe yes. It is possible. Met my requirements and had great reviews. It looked like a sturdy bed. "Is there any way I could get a replacement 1st layer. The topper and cover?" Hello Thomas, you will be contacted by Customer Care. Have a great day. "Hi, I am ready to purchase but have one important question, what is the density of the 9 inch reflexive foam layer?" Hello mbc6t7, the 9-inch base layer is high-density reflex base foam. Thank you for shopping with us! "I am wondering if anyone uses a mattress pad/protector with this, and if so which one? Thanks! I don't want anything to interfere with the benefits of the memory foam! :)"
Yes I use the bamboo mattress pad and it works out great! "What is the country of origin?" Hello donebydenn, this mattress was made in China. Thank you for shopping with us!